There was even a milkman-themed board game produced in the 1950s, called Merry Milkman by Hasbro. As you can imagine, the object was simple: the first player to deliver all of their milk to the neighborhood won the game! 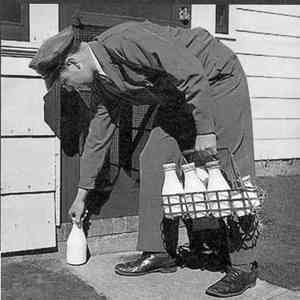 By the time I was born in the early 70s, the milkman had practically disappeared from American neighborhoods. It's not difficult to understand why--milk first got delivered at a time when homes didn't have refrigeration and needed to be consumed fairly quickly before it spoiled. In the 1950s and 60s, not only did households have refrigerators, but the first paper milk cartons were being produced, which were cheaper than the heavy glass bottles milk was first carried in. It also cost more money to have milk delivered then buying it at the local store. But the milkman may be making a comeback: in recent years I've seen news stories here and there about how the nostalgic love for milk (and food) delivery is keeping the milkman alive and well in some parts of the country. In Louisville, KY, Ehrler's Micro Dairy delivers milk, cheese, eggs and jam to customers three times a week. In one month alone, they delivered over 800 gallons of milk. A.B. Munroe Dairy of Providence, RI, is another company that provides milk delivery, mainly to the Southern New England area. They've been in business for over 130 years. And what about bigger city dwellers who crave home delivered milk? Manhattanites are in luck; Manhattan Milk, owned and operated by Matt Marone and Frank Acosta, deliver hormone-free milk and other goodies around the New York City vicinity. Interestingly, the milkman never faded away in Britain, where milk delivery remains a trend. As in the States, British milk producers/transporters have diversified their offerings to include yogurt and other foods available for home delivery. In India, milk delivery has never gone out of fashion. I'm not sure if I'd ever use a milk service myself--it's still pricier than visiting a store--but I do like the idea of a milk truck making early morning deliveries and keeping a small bit of nostalgia alive. Oh that struck a big chord. As you say, in the UK milk can still be delivered (via electric milk "floats") but they battle to survive against the supermarkets. One odd combo in some parts was a "milk and potatoes man". They are diversifying into all sorts of foods nowadays. Occasionally I hear the milk man arrive at 4:00am, whirring away. In a heavy snow fall (heavy for the UK) a year ago he kept arriving when almost everything else stopped. I love hearing that the UK milkman is alive and well and delivering even in a snowstorm! In my neighborhood in Gainesville there was also Dry Clean delivery and Charles Chips! The Dry Clean guy would throw out those tiny two packs of Chiclets to the kids as he was driving by. It was totally awsome. I was 6 or 7 years old. Mid 1960's. Here in St. Louis, Oberweis Dairies still deliver milk and other products. It's fairly expensive though. If I could afford it, I would do it. 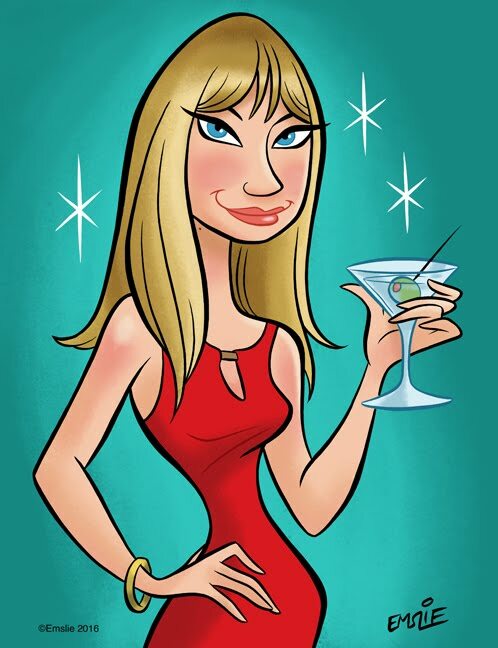 Hi Pam, When I was a kid in the '60's growing up in upstate New York, local farmer Mr. McGregor delivered fresh eggs once a week, and in the early '70's the Dairylea truck came every Saturday with six 1/2 gallons of milk for our big family. I remember when lived in England fron '86-'87, I was astonished that people still got milk delivery 91-2 bottles a day) in that modern age. In a way, it gives one a more organized, less over-indulged way of life -- you only get so much milk a day, so don't waste it! Mr. McGregor is long gone, but his name is still on an egg farm not far from where my Mom still lives. Love your posts. 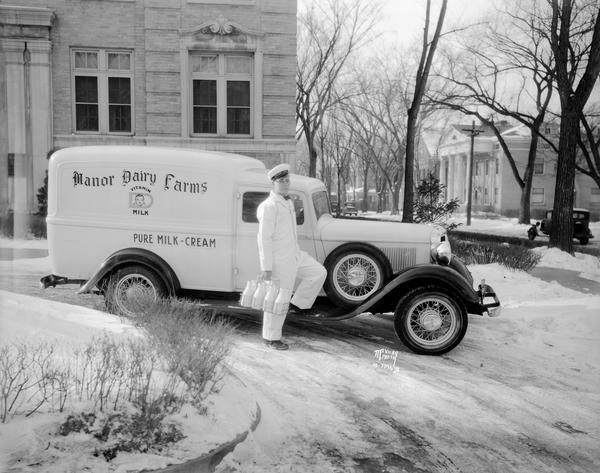 Love hearing the stories about old timey milk delivery. Thanks for the comments, everyone! In Ireland we had milk men delivering right up until the late 90's. I used to meet him on my way in from late night boozing, and would often purchase a pint of milk from him. It definitely helped ease the hangover.